KABUL – Founder and Leader of Junbish party and Afghanistan National Front (ANF) leader Gen. Abdul Rashid Dostam on Wednesday said that ANF would win the next presidential elections if the polling was transparent. 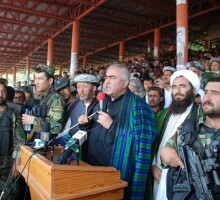 Dostum told a gathering of Tens of thousands of people in northern Takhar province that if the next election was fraud-free, the front’s will certainly win the polls”. The ANF chairman, Ahmad Zia Massoud, Hezb-i-Wahdat leader Haji Mohammad Mohaqiq, former intelligence chief Amrullah Saleh and some parliamentarians attended the meeting. Dostam said they were against peace talks with the Taliban because Afghans did not want their schools closed, schoolgirls poisoned and innocent people killed anymore. He urged the Afghans to support their army and police against these fighters, saying if the rebels did not accept peace, they would rise in arms against the guerrillas in support of the security forces. In his address to the gathering, Massoud once again accused the government of corruption and ignoring Mujahedeens. “We are heading towards deep crisis after 11 years of war,” he cautioned. Despite billions of aid dollars poured into Afghanistan to help rebuild the shattered infrastructure and economy over the past decade, the officials concerned proved they have no management skills and capability to achieve the desired goals, another Leader of ANF, Mohaqqiq, said. “The money has been embezzled and projects granted to companies having links with the government,” he alleged, adding if the government was unable to maintain security in Kabul, how it could protect the entire country. He described Karzai’s government a dictatorship, calling for district chiefs and provincial governors to be chosen by the people, not by the head of the state, through election. Ex NDS chief Amrullah Saleh said the government should introduce reforms in its institutions to win the hearts and minds of the people.